Lake Titicaca is the highest navigable lake in the world, located in the Andean Altiplano in the Central Andes between the territories of Bolivia and Peru. It is the highest navigable lake in the world. The Inca Garcilaso de la Vega describes the legendary origin of the Incas in the fountains of Lake Titicaca, in the oral traditions of the area is still considered the island of the Sun as the place where the legendary Manco Capac and Mama Ocllo came from to found the Tahuantinsuyo The truth is that Lake Titicaca, had great religious importance in the Inca and Pachacutec Inca Yupanqui who annexed Lake Titicaca and its surroundings (Collao plateau) to the empire. 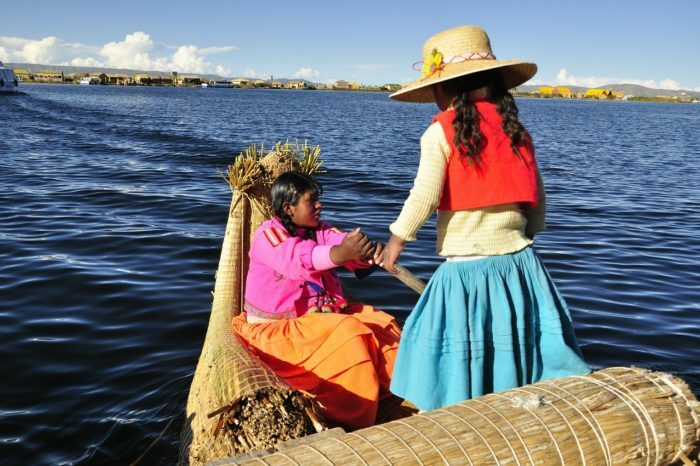 According to the Urus traditions, they fled the Inca siege by taking refuge in the lake, for this purpose they built artificial islands in the lake using the totora as raw material. In this way the population of the floating islands of the Uros in Peru begins. There is a group of artificial islands on the lake made by members of the Uru ethnic group, self-styled Kotsuna or “people of the lake”. Members of the Uru or Uuro ethnic group call themselves “people of black blood” and according to their oral traditions, they were forced to flee to the lake after the Inca Pachacutec besieged them. The life of the aurochs depends on the lake and the totora. The latter is a plant that not only make their islands, but also their boats called “caballitos de totora”, in addition to building their homes with it and build their buds. It is a place where cultural and adventure tourism is done.